Every term, each instructor needs to request an eClass course for any Bear Tracks credit section they wish to host on eClass. eClass has an automatic course request process which will link your eClass course to the appropriate Bear Tracks enrollment list(s). The request is submitted online and allows you to combine multiple sections, copy previous content forward, control the enrollments of TAs and additional instructors and specify the student access dates to your content. If you are the instructor of a regular Bear Tracks course, you need to request that course be created on eClass at the start of every term. 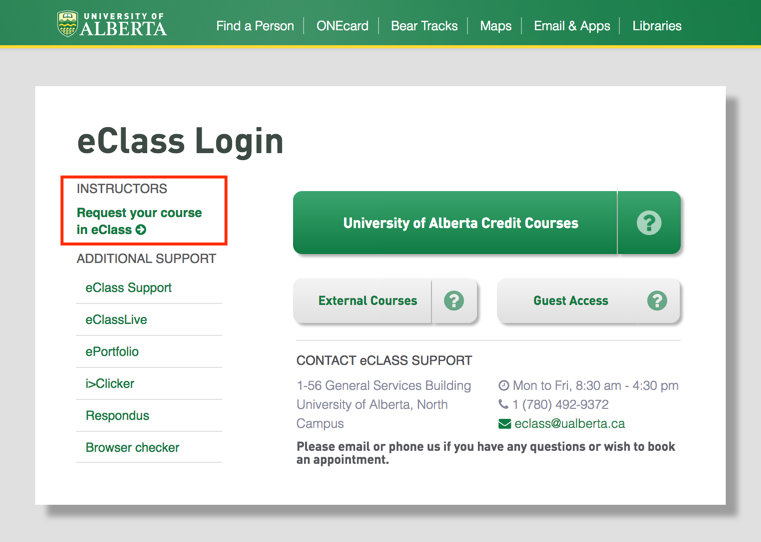 Navigate to the U of A home page (http://www.ualberta.ca), click the eClass link near the top right, then click on the Request your course in eClass underneath the heading Instructors in the left hand column. If you have any questions about this process, especially if you are unsure if you need a combined section or are not 100% certain if you are requesting your specific Bear Tracks section, please call IST eClass Support at 780-492-9372 and we will assist you. Incorrect course requests are much easier to address in advance.